1. Place flour and sugar in a bowl. Whisk eggs and milk together and add to dry ingredients with melted butter, mix until smooth. Fold in half the raspberries. 2.Pour ¼ cup batter into a heated non stick frypan, swirl 1 teaspoon of Ricotta through the mixture. Cook until bubbles form, turn and cook until golden. Repeat with remaining mixture. 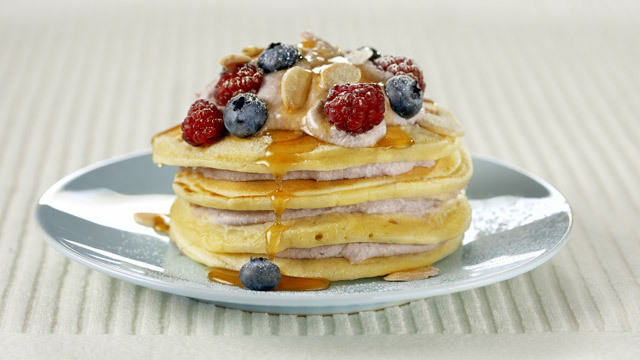 3.Serve pancake stacks, dolloped with remaining Ricotta, raspberries and almonds, drizzle with maple syrup and a dusting of icing sugar. Try using blueberries, strawberries or a mixed berry selection, when raspberries aren’t in season. YOU WILL LICK YOU LIPS!!! This entry was posted on August 3, 2010 at 5:30 am and is filed under Cooking, Family, Friends, People, Personal, Random, Recipe. You can follow any responses to this entry through the RSS 2.0 feed. You can leave a response, or trackback from your own site. Oh, Amanda! This has got to be the ultimate comfort food! Ricotta cheese, no less! Thank you for posting this breakfast delight! Your posts are always worth the time to check them out. I appreciate you, Amanda. Would you like a glass of Moet with that? tempting !! if only i wasn’t on a diet , i would have loved to make these !! !